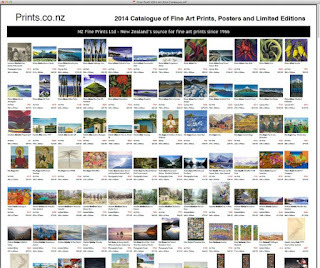 We have completed the difficult but enjoyable task of selecting and cataloging just over 500 fine art prints, posters and limited editions for the next New Zealand Fine Prints free mail order catalogue. Here is a sneak peek at our 2014 catalogue in PDF form (although we have compressed it to 8MB it will take a few seconds to download). Printed free versions of this catalogue will be available from early July. Please let us know if you spot any errors before we send this final draft off to the printers!